below the article in grantland.com under "Sponsored Headlines"
below the article in n24.de "MEHR AUS DEM WEB"
Is the labelling visible enough? 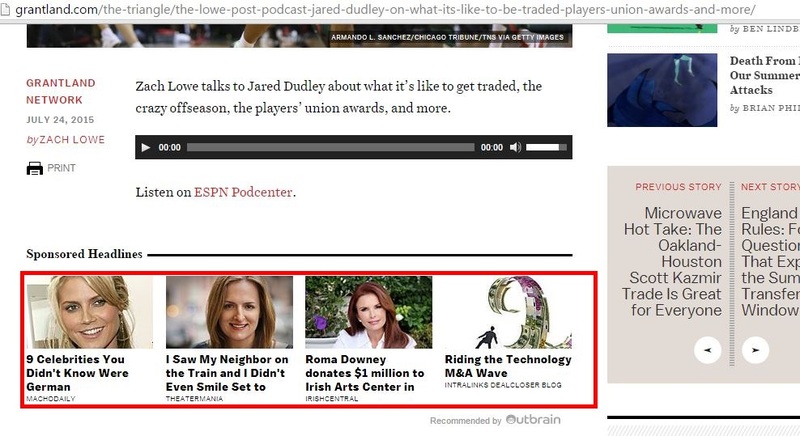 Whitelisted Ads as of July 2015.
below the article on grantland.com under "Sponsored Headlines"
How does Sky.com and Investing.com meet the acceptable ads criteria? Eye catching images- girls in bikinis! Taking-over 75% of the page. So much for practicing what you preach! keith99 wrote: How does Sky.com and Investing.com meet the acceptable ads criteria? I'm afraid we're facing a filtering issue here. The "promoted by" label is considered sufficient to recognize those ads as such. As per Sky, Outbrain ads should be blocked there. It seems that an unrelated rule unblocked too much there. We will tackle this ASAP. Thanks.